Supports of Green Monday are counting on Berkeley being only the first of hundreds of cities across the country who will pass resolutions to eat more plants, especially on Mondays. Last week, Berkeley, California implemented a Green Monday resolution, marking the city as the first in the nation to integrate plant-based eating into local government. The resolution mandates that all city-owned and operated businesses will serve plant-based options on Mondays. Additionally, at local libraries and community centers, relevant information will be displayed to the public. This information will include public programs, posters, and literature that explains the advantages of making plant-based food choices. Local businesses will also be encouraged to participate in the initiative, and those that accept will receive a sticker to put in their windows to demonstrate support. This initiative follows the Berkeley City Council’s declaration in June of a Climate Emergency, which included a linked resolution to become carbon neutral by 2030. To pass the resolution, the Council worked with the organization Green Monday, a startup based in Hong Kong that targets institutions as a key locus of transformative action. Green Monday, also known as Meatless Monday, seeks to combat dual issues of climate change and food insecurity by promoting responsible food choices. The organization recognizes that animal agriculture is driving climate degradation worldwide. When Green Monday encounters passionate people who are interested in the organization’s platform, they present opportunities to make institutional change. Berkeley is demonstrating how this institutional change can be put into effect on a city-level. The Green Monday initiative is a big step in the right direction. Through its participation, the Berkeley City Council has demonstrated a clear method whereby cities can combat climate change through plant-based food choices and has set a precedent for the nation. Of course, Berkeley’s decision is only the first step in encouraging people to adopt an environmentally-conscious lifestyle. Amy Halpern-Laff of the FFAC intends to spread this initiative to other cities as well. Next up: San Francisco. The Takeaway: Want to bring Green Monday to your city, company or school and spread the message of plant-based eating? 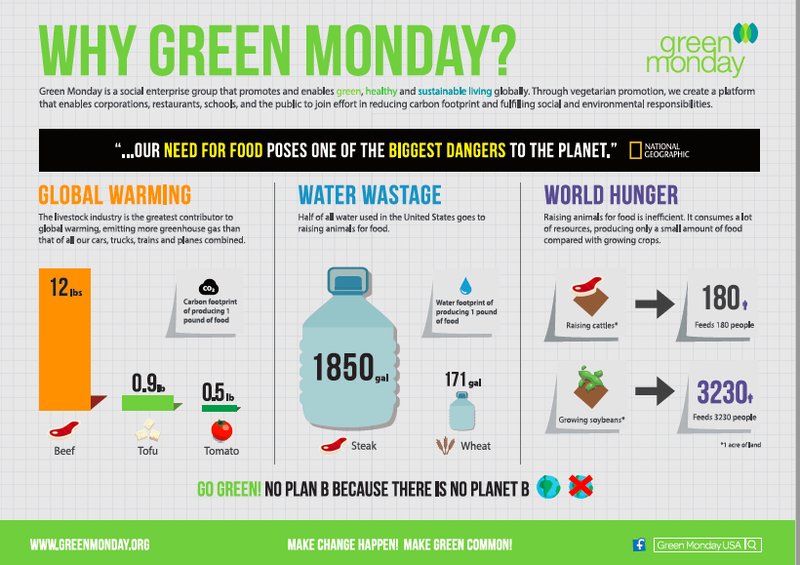 Visit Green Monday to get more information. Join the movement for sustainable eating.